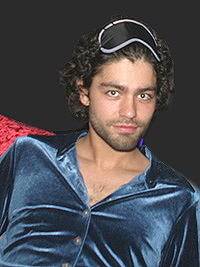 • Adrian Grenier of Entourage fame was spotted at the gay bar Starlight buying drinks. “He said he was just there with a gay friend,” reports a spy to the Daily News. His gay BOYfriend, perhaps? • Robbie Williams shakes his pecker. Via Andy via Trent. • Janet Jackson has an 18-year-old child who has been raised by sister Rebbie. Thank God Michael was not involved. • A Jell-O version of San Francisco has been unveiled. Makes sense, you know, rainbow colored and fruity. • Across the country lower class and middle class queens are outraged. Broadway shows top out at $110 a ticket. • Liz Smith says the Roxy is closing next year. Across NYC The Gays weep. Thanks Brian.